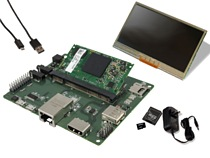 REDWOOD CITY, Calif. April 6th, 2016 — Gumstix®, Inc., the leader in design-to-order embedded systems, today announced a partnership with Toradex Inc. to provide support for Toradex Colibri iMX6 Computer-on-Modules (COMs) in Geppetto® Design-to-Order (D2O) platform created by Gumstix® engineers. Using Geppetto® D2O, customers can rapidly design and manufacture small form-factor boards tailored to the Colibri iMX6 series of COMs powered by the ARM Cortex-A9 family of CPUs, including the NXP/Freescale i.MX 6, i.MX 6 DualLite or i.MX 6 solo processors. Toradex Inc., located in Seattle WA, is the North America office of the Swiss Toradex brand which specializes in scalable embedded computing solutions and manufactures a wide range of pin-compatible SOMs. The Colibri iMX6 comes with an ensemble of features and interfaces, including UART, I2C, SPI, CAN and many GPIOs, support for USB 2.0, Ethernet, RGB and HDMI. Colibri modules are being used in a variety of different applications, including in medical devices, industrial automation and robotics. “Gumstix’s Geppetto design-to-order carrier board service is a great addition to the Colibri ecosystem. 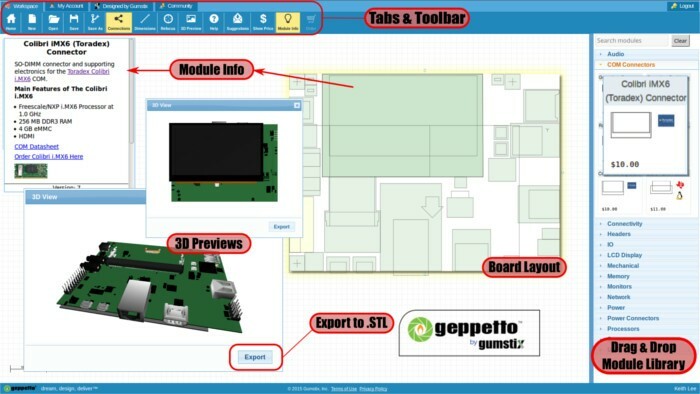 Easy to use, yet powerful, the Geppetto online design tool provides readily available interface libraries and reference designs also include wireless connectivity options - a much needed feature for today’s IoT applications and with increasingly complex requirements. Toradex looks forward to the new partnership with Gumstix and we are excited for our customers who can now create customized carrier boards for Colibri SOMs with the click of a button”, states Samuel Imgrueth, CEO of Toradex Inc. The Gumstix development board for the Toradex Colibri (iMX6) COM designed in Geppetto® D2O provides connections for Ethernet, USB and multimedia devices as well as a bootable microSD card slot. The multimedia connections include: HDMI header, a 4.3” Newhaven resistive touch screen connector and audio input and output headers. The dev board also supports WiFi and BT wireless connectivity, includes a real-time clock and GPIO inputs and outputs on headers.